Food bloggers, nutrition bloggers, recipe websites, companies that share recipe books and related products will find there are many customizable recipe WordPress Themes to set up their WordPress websites with. These themes make it easy to generate recipe posts without a lot of effort. Some of the recipe templates listed below use existing plugins to make submissions easier. Others have custom-built features that allow the blogger to display enticing food photography in productive layouts, quickly upload recipe cards with custom forms and more. 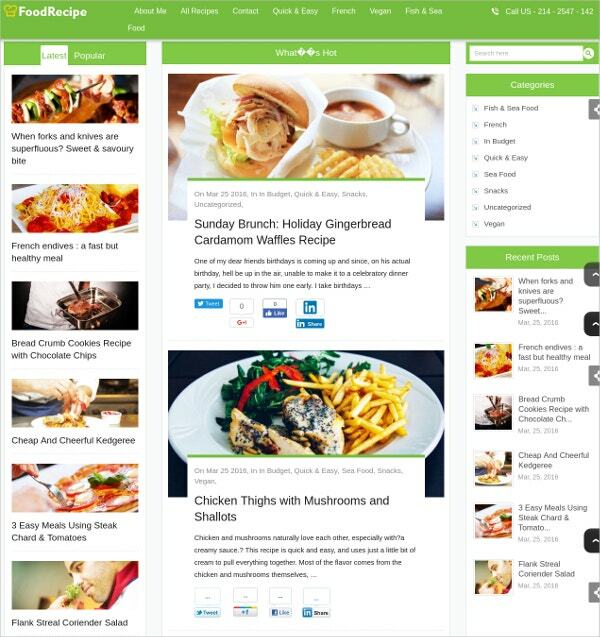 You may also see Food WordPress Templates. The Responsive Cooking WordPress Themes is a bright, mobile-friendly template that smartly organizes alluring food pictures across its homepage. It is a fully editable theme, allowing you to add custom post types and formats, translate to other languages with WPML, add a filterable portfolio, Fantastic Sliders to share images, custom social and comment widgets and more. The template is bootstrapped and coded with HTML5 and CSS3. 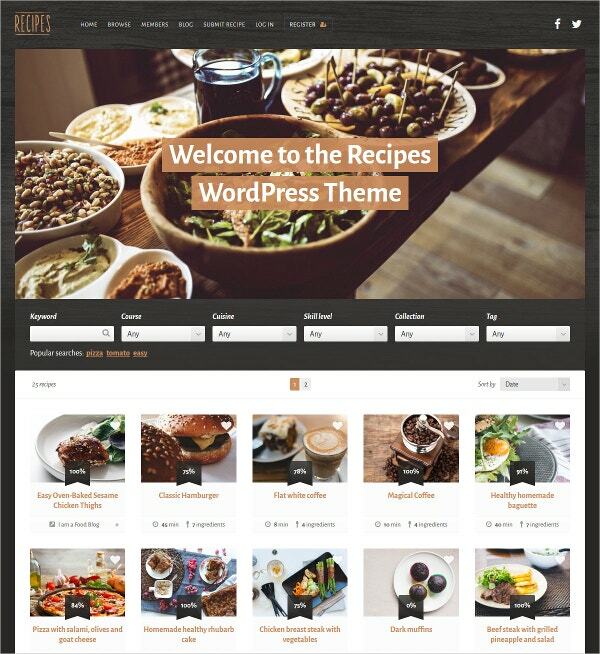 Recipes WordPress Theme is a simple, modern template offering sorting and filtering of recipes by multiple categories, dark and light versions with unlimited color choices, quick rating view, widgets for recent and top rated recipes etc. You can add a clickable ingredients list with multiple ingredients, customize styles for recipe directions, list related recipes at the bottom and more. The theme is built to be responsive and retina-ready, and includes member directory, front-end recipe submission, ad placements, color picker, recipe microformat support, Google search compatible etc. 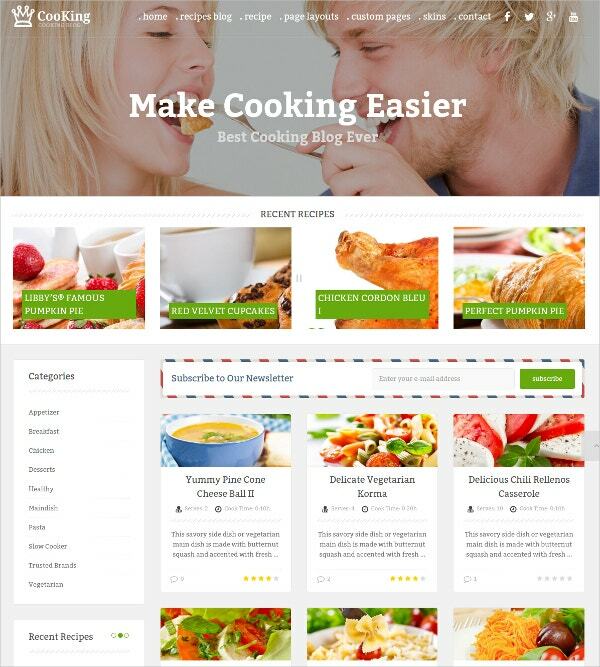 Cooking Recipes Online WordPress Theme is an image-focused, fully responsive theme built on Bootstrap and animated with HTML plus JS. Features include custom post types such as Our Team, Portfolio, Testimonials, Services, multiple page templates, carousel and slider gallery scripts, Cherry Framework, SEO friendly, WPML ready and with portfolio or blog functionality. It comes with over 80 shortcodes and the layout immediately captures the viewers’ attention. 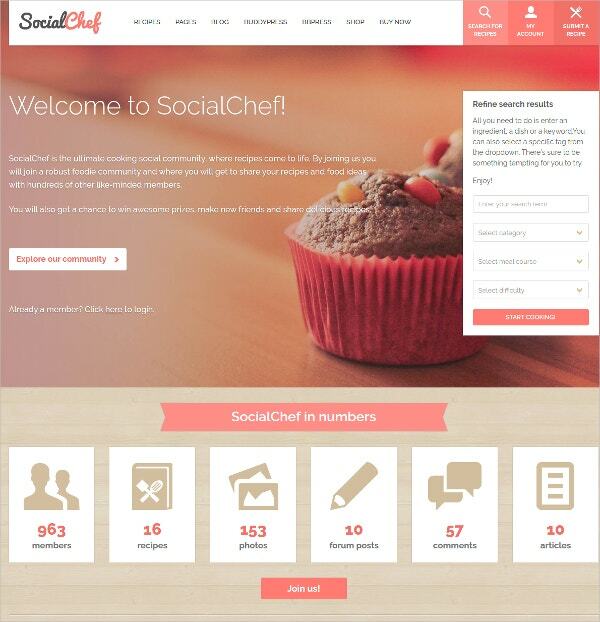 SocialChef is a responsive, 1170 p grid system template that can be integrated with BuddyPress for easier social sharing. It gives you features such as front-end submissions, extensive theme options, facilitates community participation with activity feeds and member profiles etc. Also included are RTL support, WPML support, 12 predefined color schemes, advanced search and other features. 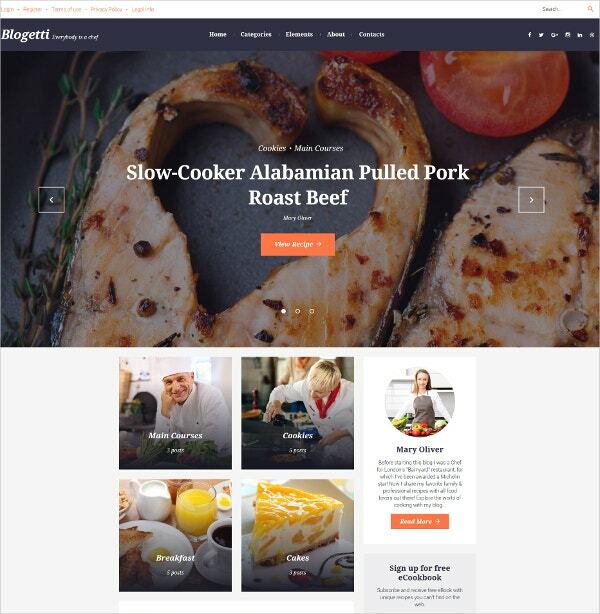 Blogetti WordPress theme is a clean, responsive, and modern blog template that makes good use of white spaces. Features include WordPress Live Customizer, 100 percent GPL free software, Bootstrapping advantages, SEO friendly, valid code, Google Fonts, rich widgets and more. The live customizer lets you make changes and preview them in real-time. 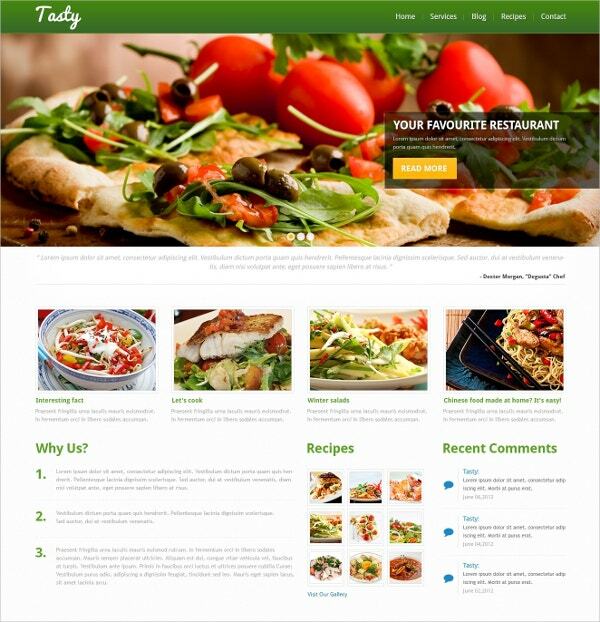 Food Recipes is a light WordPress theme with a feature-rich and easily navigable design. Features include 5 slider variations, 2 recipe page designs, 8 custom widgets, shortcodes, easy theme options, 7 PSD files, SEO friendly code, support for microformat recipes, Favicon and more. 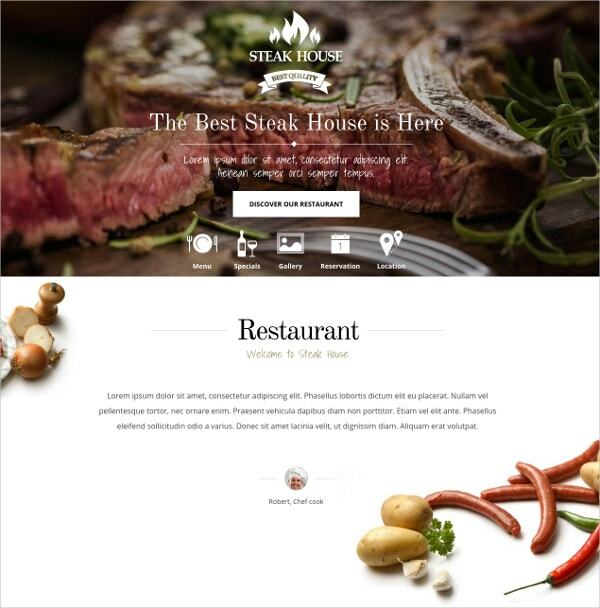 It can create a fully responsive website with front-end submission, threaded comments, users listing template for sharing info about the chefs, video support and more. 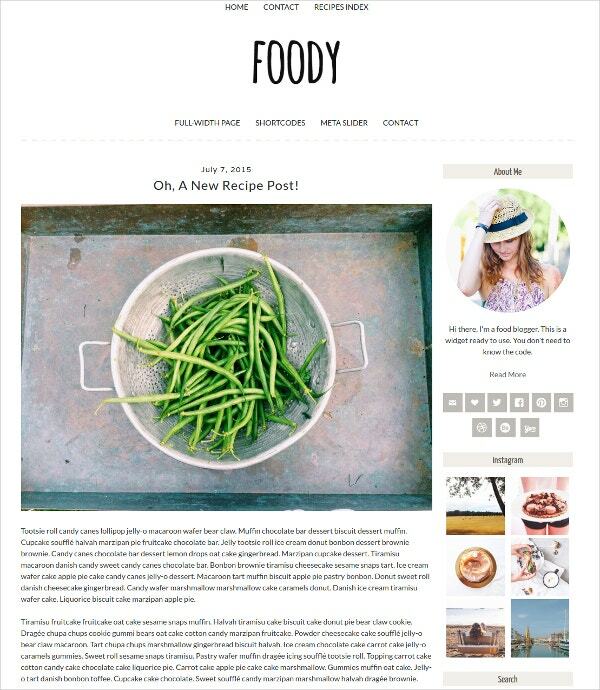 Foody is an uncluttered blog theme ideal for chefs who prefer minimalistic designs. It uses dynamic grid layout for the archive page and blog, Google Web fonts, color options, shortcodes, footer with two areas of tree columns and full-width sidebars, translation ready etc. 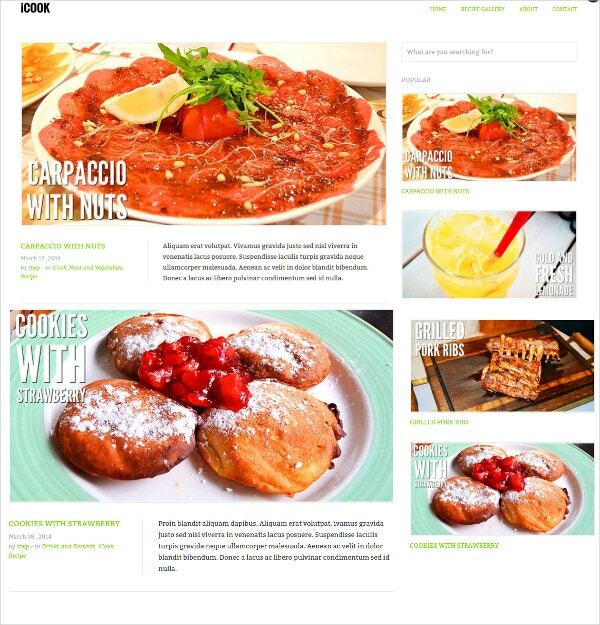 The template can be used to create a fully responsive food blog that is compatible with major browsers including Chrome, Firefox, Safari, Opera, IE 9+ and mobiles. CookBook Recipe is a WordPress food blog template that can also be used for creating online cookbooks and culinary magazines. Features include recipe pages with custom page templates, add video recipes, organize recipes by types of cuisine, add extra fields like preparation time, cooking time, servings etc., easily add nutrition facts and ingredients lists. Shortcodes for social icons, buttons, columns and boxes etc., blog post templates and other features are also included in this responsive theme. FoodRecipe is a simple theme with 8 predefined colors and a powerful admin panel to customize the demo to suit your needs. 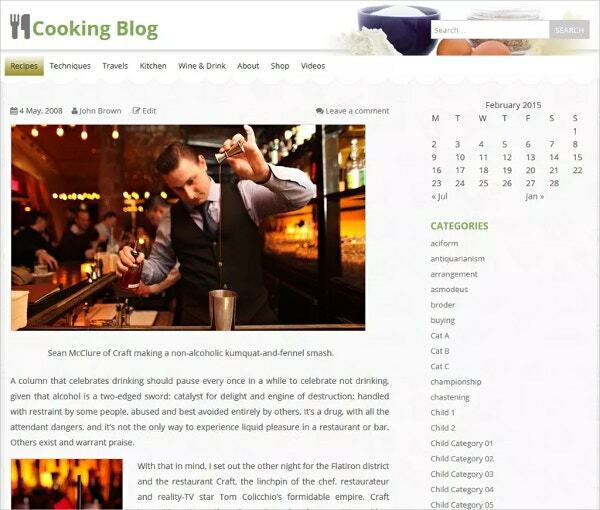 The template offers a 3-column layout to display popular food blogs, featured posts and recent posts in separate sections. It offers a widgetized right sidebar, widgetized footer, logo upload, social sharing icons, contact form, tap to call button for smaller devices, Google Map support and more. 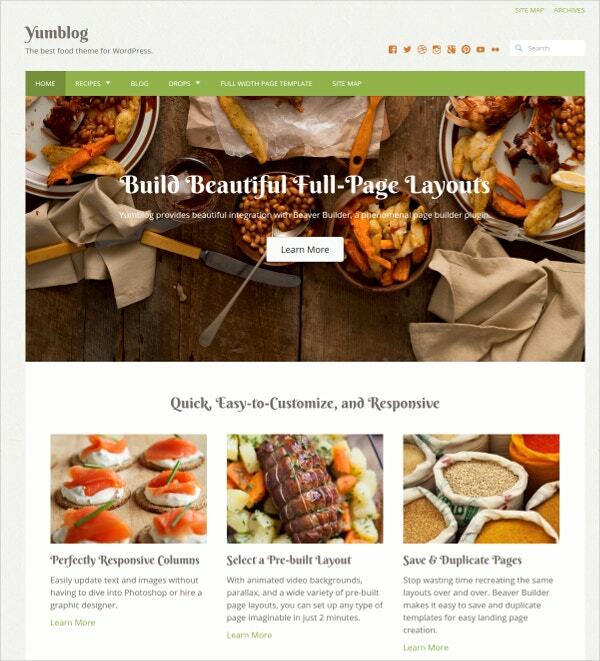 Yumblog 2.0 is an attractive blog which lets you build responsive, full-page layouts. It uses the Cooked plugin (which is included free) to help you with front-end submissions, recipe search, full-page viewer and more. It can be integrated with the drag-and-drop page builder Beaver Builder, and is developer friendly for use with Sass & Compass, Zurb’s Foundation etc. Food & Cook is a light colored theme for sharing recipes and online cooking tips, with crisp typography and an elegant design. It is a free theme, but it comes with features such as forms, custom menu, a two-column layout that leaves your website uncluttered, theme options, sticky post options and a responsive layout that looks good on any device. wpcook is an attractive and feature-rich template that puts a lot of emphasis on the details and visual data representation. It comes with features such as custom recipe posts with several detail fields, chef profiles, custom badges for recipes, bbPress plugin ready forum for community involvement, over 650 Google Web fonts, a responsive LayerSlider, over 369 vector icons that are retina ready. It was built using CSS3 and HTML and the ReduxFramework. It is WooCommerce ready. 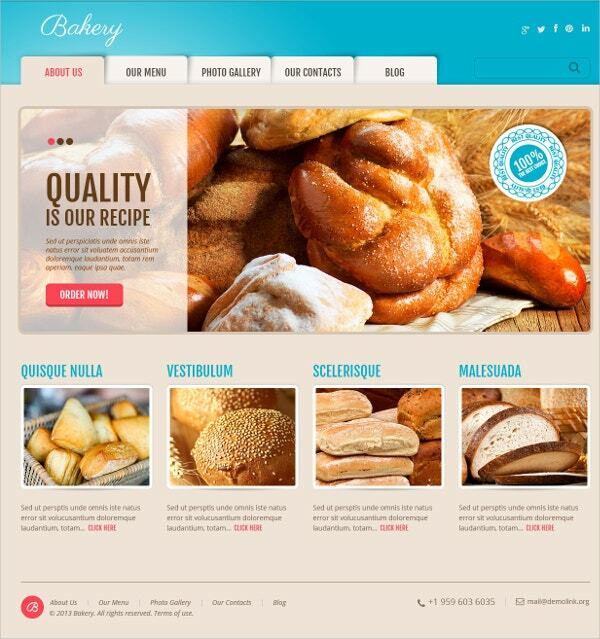 Delicious Bakery is a 1920 p WordPress theme that is beautifully designed to let your food images speak for themselves. It is a fully responsive theme with custom post types, WPML, over 80 shortcodes, 2-step installation, over 600 Google Fonts, Fantastic Slider, filterable portfolio, custom widgets, built-in customizer and more. It is bootstrapped and coded with HTML5 and CSS3. Also allows an audio player and video integration. 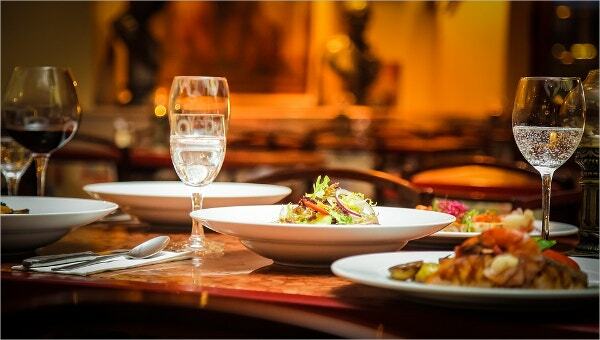 Steak House Food can be used by food services like diners, burger bars, grills etc. to showcase their services in a visually stunning way. The elegant and responsive theme uses bold, trendy colors, and comes bundled with several additional pages such as reservation, gallery, menu, contact, countdown, about us and more. The theme customizer lets you change headers, background color etc. with live previews but you can use the 5 predefined backgrounds and color styles to set up your site immediately. iCook is a stylish white WordPress theme with responsive design, a filterable recipe gallery, custom shortcodes, popular widgets, quick ingredient listing, custom backgrounds, contacts and map with custom icons and more. It lets you create a custom logo, add social platforms, AJAX contact form, 12 column grid, 4-page templates and the twitter bootstrap for easy use of shortcodes. 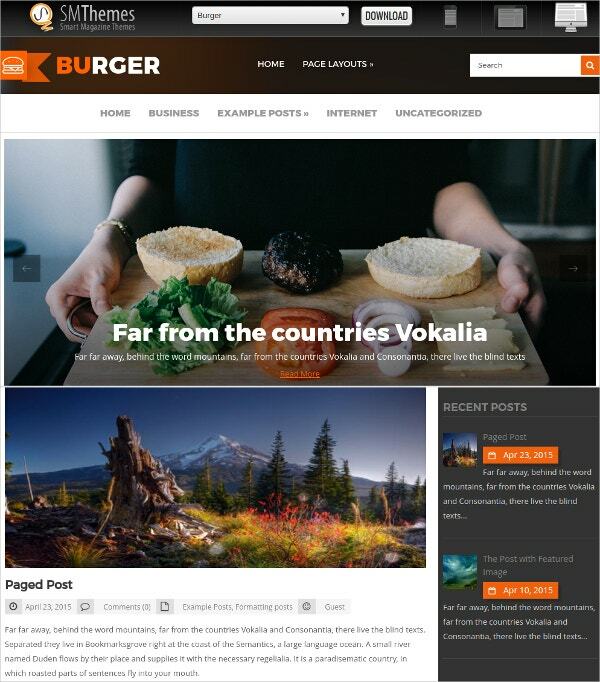 Burger by SMThemes is designed for owners of cafes, foodies, and others who are looking for a professional-quality, free theme. It is built on the SMT framework 2.0 and supports Ecwid, and WooCommerce. Features include Dynamic Content Loader, Google Maps shortcode, Custom sidebars, custom widgets, social share, shortcodes, contacts page, slider ready, SEO, antispam without the hassle of Captcha, multi-colored related posts and more. PE Cooking Blog is a fully responsive SEO optimized white template which comes with a premium Visual Composer and Revolution Slider plugins. 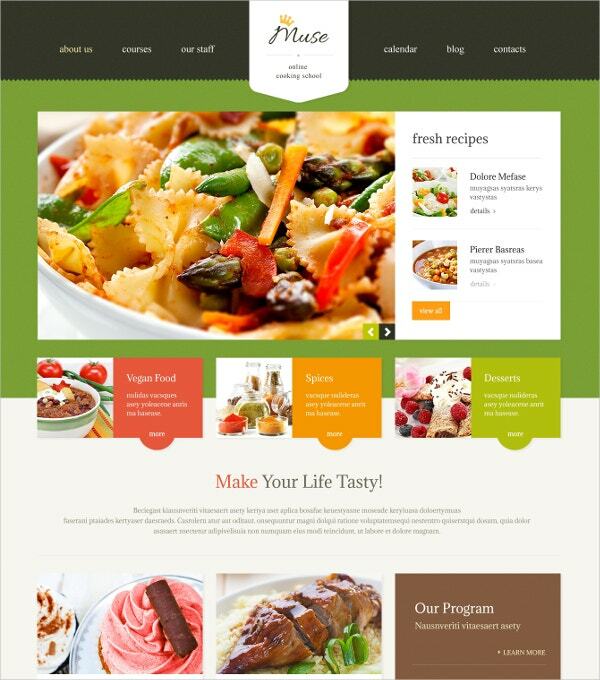 The theme is compatible with WPML, Contact Form 7, Display Widgets, front-end and back-end recipe submissions. You also get a powerful admin panel to customize recipe type, tags, skill levels, ingredients etc., 6 blog views, detailed recipe posts classified by cuisine, type etc. You can also easily add step by step methods and nutrition information. 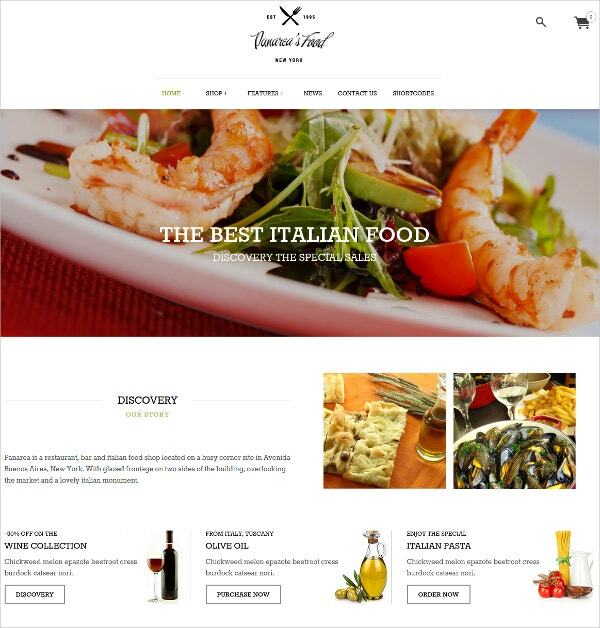 Panarea is an elegant theme for restaurants that is built on the Yithemes framework. It is a responsive theme with rich features including visual composer, filterable portfolio, 3 slider types, wishlist, product image zoom, extensive theme options, sample data, shortcode manager, custom widgets, unlimited contact forms, over 600 Google Fonts, over 300 shortcodes and a customizable pre-launch page. 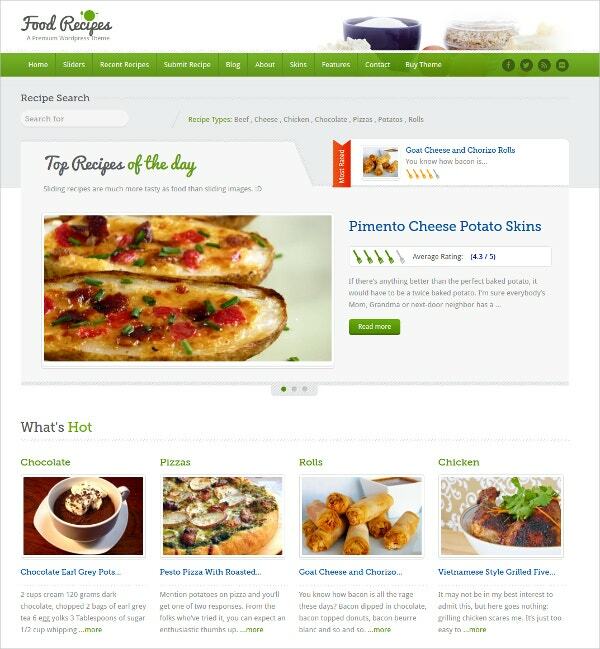 Cooking and recipe themes for WordPress are of many kinds, and you have to choose one that suits your requirements. For those working in the food industry, premium templates can help set up food service websites with all the relevant pages and reservation options etc. 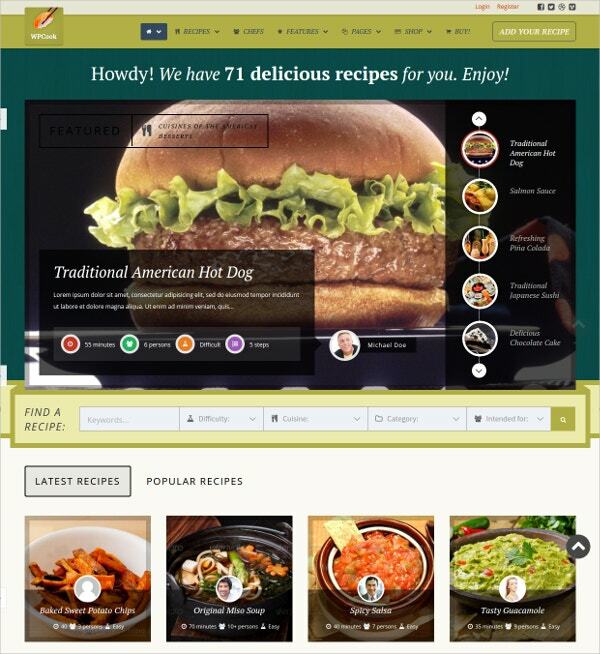 For bloggers, modern, responsive themes with easy recipe submissions and organization are key. Retina ready templates help magnify the clickbait potential of food images. You can also see Responsive WordPress Templates.